The only thing that makes this CD worthwhile is that it's the only soundboard available from the November tour. The sound is mediocre, and the setlist is very standard for 1976. Although there are many enjoyable shows from 1976, it is generally not an enjoyable concert year. We know Elvis didn't vary his setlist much this year, and we know he was out of it for the most part. Elvis was depressed, had lost the will to live. Simply put: He had given up. So much is clear from the way he let himself go, both physically and artistically. I think Tucson '76 is a fascinating concert, because it shows the level to which Elvis had descended. And still, one month later, in Fort Worth, he proves that he’s not completely out of it (Rockin' Across Texas, CD 2). Then, one month after this, he goes straight to hell in Hampton Roads, Virginia (Bicentennial Elvis Experience). His problems would continue at least one week into September (Still RocKING the Nation). These Summer tours were a rollercoaster, and you never knew what you would get. Then he pulled himself together and started losing weight. In October, he was slimmer than in a long time, and his shows were pretty good (Chicago Beat, Bringin' The House Down, Eternal Flame). He had perhaps gained a little weight in November, but his shows were still good and focused. The problem is that the majority of these shows are above average for 1976 but second-rate compared to 1975 and a disaster compared to 1970. 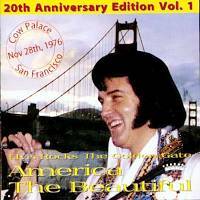 I'm afraid America the Beautiful is just another auto-piloted 1976 concert. Nevertheless, it should be included in the collection as a documentation of the November tour.